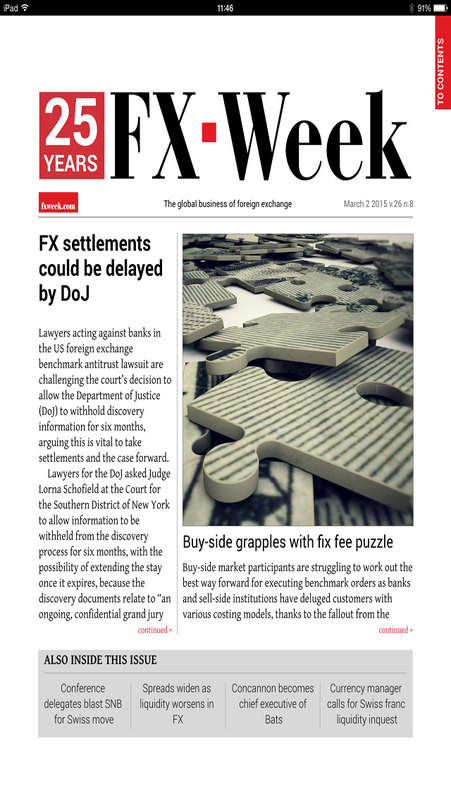 Published since 1990, FX Week is the industry’s exclusive newsletter for foreign exchange and money market professionals working within commercial banks, investment banks, central banks, brokerages, institutional investors, multinational corporations and vendor companies serving the banks and financial institutions. Always the first to deliver cutting-edge news stories and special reports, FX Week ensures its subscribers are kept informed of all the key events and developments in the forex industry. FX Week’s expert editorial team operate out of London, the heart of the foreign exchange market, with support from our editorial offices in New York and Hong Kong, ensuring that subscribers are provided with the information on the powerful forces that are making the markets tick and the events that are shaping the FX industry world-wide. 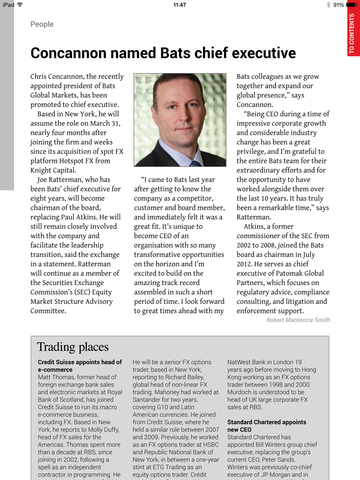 Available via an annual subscription or as part of a corporate licence to FXWeek.com, this app will allow you to read FX Week at a time and place that suits you as well as ensuring you get access to the information as soon as it’s published. If you have any questions about the FX Week app or a subscription then please call on +44 (0)20 7968 4618. Alternatively, each issue of FX Week is available to download via the app for £79.99, or a three month subscription costs £699.99. Your iTunes account will be charged when you choose to purchase a subscription. At the end of the three month period your subscription will renew unless you choose to cancel (see below). Your iTunes account will be charged the renewal cost for the as applicable within 24 hours prior to the end of the current subscription period. You may manage your subscription, or cancel the auto renewal, at any time via your iTunes Account settings. However, subscription sales are final. If you choose to cancel your subscription will cease at the end of the current period – no refunds will be given.